Navy ships had the right under international law to operate in "waters outside of other countries' territorial waters", the defence ministry said. China is also taking part in the drill. It has sent four ships with an estimated 1,000 sailors onboard to the Rim of the Pacific (Rimpac) operation. Twenty-two countries are taking part this year and it is the first time China has been included. The US acknowledged that it was the first time that a participating country had also sent a vessel to monitor the exercise. Captain Darryn James, chief spokesman of the US Pacific Fleet, told agencies that China had sent a similar ship to the last Rimpac exercise in 2012. He added that the US had taken "all necessary precautions to protect our critical information". 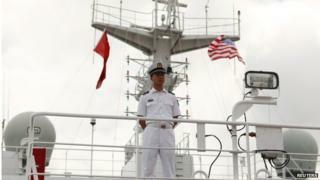 Some US-based media outlets have questioned the presence of the ship. The Wall Street Journal labelled it a "party crasher" that was "enjoying an intelligence buffet at the world's largest maritime gathering", while Bloomberg quoted an analyst as saying that it sent "a bad signal". In December 2013 the US and China squared off over a near-collision of their ships in the South China Sea. The US said its guided missile cruiser USS Cowpens was forced to take evasive action, while Chinese media reports suggested that the US had been harassing its new aircraft carrier, the Liaoning, as it underwent sea trials.